Canonu2019s EOS 60D digital SLR has scooped Amateur Photographer Product of the Year. Canon?s EOS 60D digital SLR has scooped Amateur Photographer Product of the Year. Fending off stiff competition from Sony?s Alpha 850 and Nikon?s D7000 DSLRs, the EOS 60D was also voted Enthusiast Camera of the Year at an awards ceremony hosted by Amateur Photographer (AP) Editor Damien Demolder. 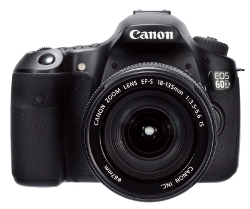 Announced in August 2010, the 18-million-pixel DSLR camera was pitched between the Canon EOS 550D and 7D and replaced the two-year-old (15.1MP) 50D. Squarely aimed at photography enthusiasts it uses the same sensor as the 550D and borrows its low pass filter from the higher-end 7D. AP?s technical team praised the ?combination of a high resolution sensor, its host of advanced features, excellent handling and first rate image quality?. Announcing the winner, at an industry-pack ceremony in central London, Damien said: ?We had to determine which product would bring the AP reader the most benefit, and which would be most likely to deliver complete satisfaction.? AP?s product reviews assess a wide range of characteristics, from handling to colour reproduction. The Amateur Photographer Awards have recognised the best photographic equipment for 35 years. There were 18 categories for 2011, 15 of which are for excellence in product design and function, two for outstanding people of our time, and a further category for good retail service. One Whitehall Place was the venue for this year?s awards presentations.